Make your move in the SL Black Sheep Rengo 2003! As suggested by DJ black might choose a new move 191 on this Diagramm, as the ladder beginning with white a, black b, white c (last dagramm) is more than black can take. The fans need to see more !!! Tas B191: We'll then lets continue (though this is an old game). This new B191 should definitely save the dango, and ensure the territory above it. Could propably be made more efficient, but it'll work. Double atari by the way. Juuitchan: B191. Is this a wasted move? unkx80: Sorry but I shall resign. If the other black players want to carry on, please go ahead. Juuitchan, do you know the meaning of W190? HolIgor: W176. This move seems to be double gote. HolIgor: W170. Added two captured stones to the bowl cover. Difficult decision. The move is worth 2.5 points plus while the descent in the lower left corner is 4.5 points. Yet, that plus is too disturbing. It is difficult to evaluate As it involves very large ko. I'd like comments on this move. Did I chicken too much, did I agree to lose here? The game is lost for white anyway. The question is whether the white can manage to lose less than 10 points. dnerra: B169. That move has been waiting for a while. HolIgor: W168. The only move. unkx80: B167. Sacrificing an extra stone. HolIgor: W166. An obvious move for white. dnerra: B165. Hah, I can continue my plan! unkx80: B163. Lets wrap up this game. HolIgor: W162. I make the second in the row too. DJ W156: I do not like White's shape here... Who knows if now it is worse! reteiD: W152, thanks unkx80 for keeping the game alive. reteiD: W150 Looks like HolIgor needs a team mate. HolIgor: W148. White cannot win the ko. HolIgor: W146. The cut has to be protected. unkx80: B145. Going for sente again. HolIgor: W142. I feel that this is big. Andre Engels: B141. Seems forced. Migeru: W140. This seems big. HolIgor: I planned to play (not immediately) a here. Then b and c would be two points to aim at. White has to keep in mind the possibility of a push at d. Now White would play nobi and osae after another push. But if Black starts with a W140 becomes exposed. HolIgor: W138. I think that this point is important. HolIgor: W136. Before taking big decisions. unkx80: B135. Big points up for grabs. HolIgor: W134. White could have played at 'a' but I feel that there is little use to defend a territory open at the other side. So, playing thick here. HolIgor: 130. Trying to put up a fight. 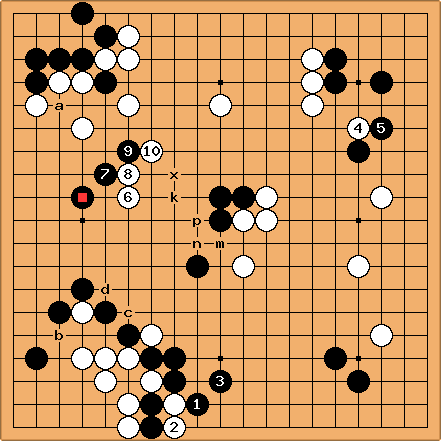 B127 was excellent, making White's bad shape look even worse. It is possible that White's reply should have been at b. After White's 128 the bad-shape white wall is in danger. W128 was important of course, but White has to look for a possibility to play at b. It is safe and it is big. Migeru: W128. Time to plug up. HolIgor: W124. Again this area seems to be profitable both for White and Black. 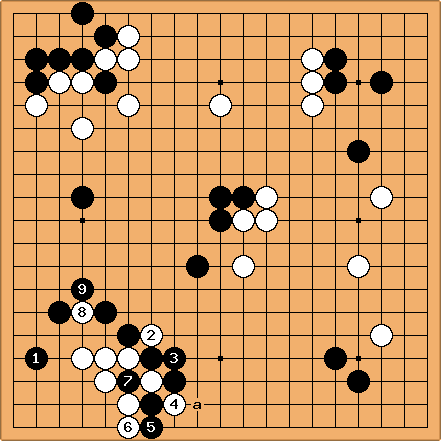 Black can expand his corner here. 123, Dieter: Before White gets a chance to turn the tables. I thought White can at least force a semeai here. Leave it as it is and learn something when White cuts. unkx80: Actually I think the value of 123 is not that small although I never really counted its value. It denies White the chance of forcing a capturing race and racking up profit at the area around a in sente. Charles I agree with Dave: a safety play is another name for a mistake. But I also agree that semedori here was going to be important, quite soon in this game. HolIgor: This is rengo. Whoever wants continues to play. I don't resign yet. I want to play yose in which I'd know the values of the moves. And I want to try all aji on the right. This does not mean that a new game cannot be started. Charles Good luck! I've made a new rengo so we can have some opening discussion at the same time. HolIgor W120. I think that on the previous move White had to play descent. If the opponent cuts then push twice and capture one stone. Then the opponent has to capture 4 white stones and White has sente at least. After White 118 the area at the top is the largest ,as it is the area where both opponents may build a territory while in other areas one of the opponents has a view for territory while the other can only erase. I have to say harsh words about White 114 and White 116. Two moves while the opponent has the same effect with one only. It is very inefficient play, in my opinion. Charles I think the White side will have to find some big money to use in the transfer market before 2004: the teams aren't really even in strength. HolIgor: According to the RICOH Pair cup webpage the ladies were intimidated by the perspective to be paired with Ishida Yoshio because he sighs when his partner make a move that is not to his standard. Eventually he was paired with Umezawa Yukari-sensei, who reminded him that she plays best go when relaxed. I don't know if that helped but that advanced to the semis where lost to Inori Yoko - Cho Chikun pair. In the quarterfinals, though, they played with Kobayashi-Takemiya pair who had a very serious direction of play problems, Takemiya pulling up while Izumi trying to squeeze underneath. I want to say that we have to consider these rengo games as teaching and rather explain the mistakes than discourage weaker players to contribute. Charles is stronger than me by 4 stones and I am stronger than some other members of the team. So we have to teach and learn. No transfer market. I did not like W114 and especially 116 because sealing the opponent from this side was less than the loss at the top. Why? White's sphere of influence on the right side leaks a lot yet even after the W116 while at the top white could have take a solid grip on a good chunk of territory. And the worst thing was that White lost sente. Charles Nobody can hear you sigh in cyberspace. That's a good thing for rengo - I agree with my teammate about that. Unfortunately <sigh> he's also correct that White has been losing ground in this game. Up to about 25 moves ago we were doing really well; now I think White is losing by at least 20, since Black hardly needed much on the lower side. So, we might resign? There were many interesting points earlier. Perhaps White 56 had to enlarge the ko. White 58 is fascinating to me: three possible local threats, but all losing something. Strategically, the tenuki plays were very significant, and the use of influence instructive. (Mostly bad, to my taste - what happened to attacking play?) Anyway, how about a fresh Vernal Equinox Rengo 2003, starting just a little late, same starting teams? But we should get Black this time. Migeru: I have a distinct feeling that I am largely responsible for White losing the edge and I apologize. I don't know how to feel about Charles opening up a discussion on every one of my moves after , I have learnt a lot from those pages but I swear I could hear you sigh in cyberspace every time. Charles No, not a problem. One should join a rengo to see what happens. This is an unusual game: it seems to me that the macroendgame began with Black 51, and there were many delicate issues and positions after that. But with the board divided in the centre so early, you can't talk about strategy in the game in the same way. In the end we saw something 'happen', and the material has clearly caused many pages of analysis to be created. I just think now the game will not have such an interesting future. About teaching, my views are expressed at http://www.gobase.org/studying/articles/matthews/dans/19/. But in this kind of slow-motion rengo, individual moves are criticised (including mine). As my colleague HolIgor says, it should be instructional. HolIgor BSR 2003 W118 discussion. unkx80: B117. With hindsight it might be better for me to play B113 at d. But then I have been targeting this move all along. Charles BSR 2003 W112 discussion. Dansc: W116. I think this both closes the white territory and keeps 114 from being cut off. dnerra: B115. Yes, I am timid, but I wouldn't know what to do against W c. Maybe B113 should have been at d? unkx80: B113. Of course b is very big. But then, I think Black has to create some chances. Migeru: W112. Taking a dive... Here's my reasoning. White needs to regain the initiative and a play at 3 has a miai value of 6. I think is sente and worth at least that much. unkx80: B111. The endgame continues. Charles W110. This could be going better for White. dnerra: Maybe W should play at a first, which seems to be sente? unkx80: B109. No complaints about B105 and B107, but I also think that if Black plays 109 before 107 then White a will be way too big. Migeru: . I think this is the right reply. BSR 2003 W108 discussion. dnerra: B107. 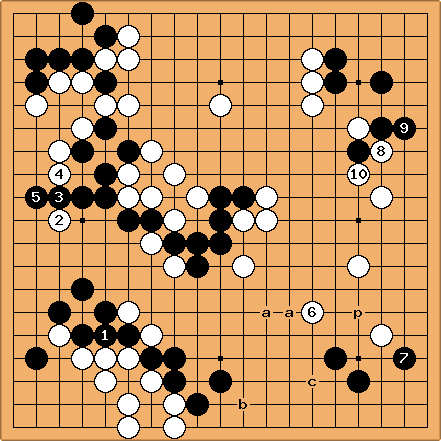 I apologize in advance for this move, because it's not good Rengo spirit, spoiling Dieter's intent with B105. But this move just looks much larger to me, and most likely sente, too. A white move at a would pretty much have closed the white center territory here. Dansc: W106. I guess that should be blocked. Dieter: B105. Let the endgame commence. HolIgor: W104. Very ugly move but I don't see much point in playing ko here. unkx80: B101. No ponnuki, please. Dansc: . Against the proverb, but I dare to do this because of the white stone below. Charles BSR 2003 W100 discussion. Charles: . Sort of tenuki. Dieter: . Sort of miai. HolIgor: . I believe this is the hottest area on the board at the moment. At the boundary between two spheres of influence. Charles Invade or reduce is one type of decision, in the abstract. Here it's more complex, since this is a focal area and a reduction play ought also to be judged by the way that it builds up White's area. as played looks like good shape, so from that point of view I approve. Consider that before Black could press White down with p: now it doesn't work. But I was wondering about an invasion. White at c is an interesting point, since White b can be played as a threat to connect out. It isn't easy to see now: Black has become stronger in the centre. Migeru: . A black play here would make an eye and force White to protect against a double atari. Charles No, not 'force'. White can give up one stone. /W94 discussion. HolIgor: . Trying to stay true to the fundamentals. Kageyama discouraged ladders that cannot succeed, thus no more atari for the moment. Even if the placement does not succeed in living, one can hope for the elimination of aji at the top. Charles So glad someone else played this ... I wasn't sure I had the nerve. Migeru You people are way over my head here. When the dust settles I'll ask more questions about . Migeru: White 90. Let's see how this turns out. I hope this is what Charles had in mind with . Charles White 88: Currently, maybe worse for White. HolIgor: White eats one stone and puts it in the bowl cover. We are playing by Japanese rules, aren't we? 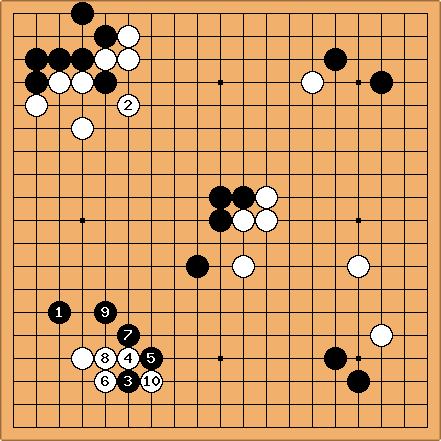 Recently I played on a real goban and my Chinese colleague did not hesitate to take stones from my bowl cover. I did not notice first, then was a little bit worried, but in the end we counted my black stones and territory. Unfortunately they did not add to 181 despite the fact that I started with four of them. unkx80: . I intended to cut anyway... think my reading should be correct, or? Charles Hey, you guys are mostly several dan ... don't need so many hints? Charles White 82: Natural, so I'm keeping it going. unkx80: . Black is behind, and I think Black can fight this battle. Charles White 80. No reason to follow suit. unkx80: . Play a honte move before figuring how to clear this mess. DJ : Is this move good shape? does it peep somewhere? Ah! What do I know? W 76: HolIgor: Protecting against the cut. Charles OK, but what about c ...? DaveSigaty : It may well be better to play "b" as a forcing move first. Instead this move concentrates on the main issue of the cuts in the center. I'll say only this: finally an easy move for me to play! Dave: I wasn't being too serious. I just couldn't find a comment that wasn't a big hint to my team mates about what I thought the next play should be. Unfortunately I think that the 73/74 exchange creates some serious damezumari problems for us black sheepers (hint, hint :-). I was hoping for the direct cut at "a" instead. Since the cut is still an important issue we can leave it for now but perhaps come back later to analyze how it would have gone. White 70: Migeru This also looks mandatory. My first impulse was to cut, but I think that doesn't work. Cut discussion. Black 69: dnerra This hane looks mandatory. White 68: Charles Happy with this exchange. W 66: HolIgor: Rengo should be switchy, shouldn't it? B 65: dnerra: Hane on the other side seems to fail, so we have to try this one. White 64: Charles Matthews White has sente, unexpectedly. Let's see if Black can defend as well as make bullying plays! W 62: HolIgor: White takes the ko and lives. B 61: Dieter: Giving in after increasing the ko may be a loss, but I felt that the exchange of 58 for 59 is a loss for White and any ko threats I could come up with where either too small, too small in number or too vague. Sorry if I have spoilt the fun of playing ko. Charles Matthews I assumed that Black had four or five good threats, starting with a. I agree about White 58 - I didn't like it, even though it was played by someone stronger than me. dnerra: I don't understand why you dislike White 58. Surely White has to play a local ko threat, and at least White 58 keeps the option of the follow-up at b open (leading to one of the variations discussed on /B51 Discussion). White c, while it looks like better shape, actually destroys this possibility. Charles Matthews White 58 and then White b looks like a clear mistake in order of play. More on the discussion page. One major issue: should White play threats that decrease in size, or increase in size? I think in this case the latter is better. Charles Matthews White 60. Retakes ko. unkx80: Black 59. It looks to me that this ko threat has to be answered. Lucky: White 58. White should play a local ko threat. Charles Matthews White 56. I thought this was automatic, but I guess I play it to keep things moving ahead. HolIgor: Isn't it time for White to decide if she wants to increase the value of the ko even further? exswoo: . Well, a descent seems like as good a move as any. HolIgor: This is called increasing the value of the ko. It is a very dangerous thing. Let's see how it turns out. HolIgor: . I think that White has to break through I'd like to do it with ko. This is the point when the moves have to be precise. 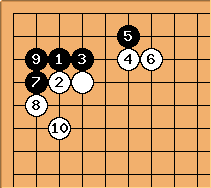 If Dave played a hamete with 51 then it will be instructive for the kyu players if the dans would explain what is happening and what move is the best. Charles It is indeed a good example of the need to think about timing. unkx80: Black 53. Uh oh... I think 51 is a mistake. Charles Matthews White 52. This. HolIgor: White 50. Surely, Black's moyo looks scary, but if White makes a reduction move on the right Black would probably extend on the left. Self-made rule: shoulder hit against the third line, a threat to go underneath against the fourth line. Charles Matthews White 48 really is a vital point for shape; White 46 is just for territory - I agree with HolIgor about that. This is in fact a classic case where Hane at the Head of Two Stones would wreck White's shape: if Black plays at 48 White loses both influence in the centre and points on the edge in the endgame. Since White is now strong to the left, this mattered more at 46 than taking territory. exswoo: Black 47. I was considering a instead but it seemed a bit risky in a side where White has so much influence. The left side also looked promising but I figured that the potential cut at b would minimize White's move in that area. It also leaves open the possibility of an additional extension on the right side later if White doesn't play there. Migeru: White 46. I think this is better than extending after Black 45. HolIgor: I disagree. We are talking about the fundamentals here. 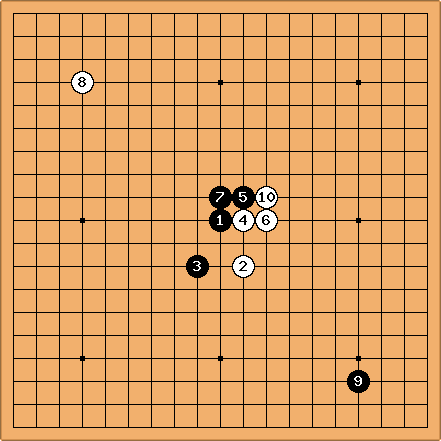 A move on either the left or the right side would have two purposes: extend one's own potential territory and limit the opponent's expansion, while the move at the top is just building White's own territory. This move helps the two white stones at the top a litle bit but since it creates no pressure on Black it is not the largest move on the board. What do the dan players think? dnerra: To add a little to Charles' comments above: It's really not so much about dual- or single purpose move. It's about horrible shape for white if black hanes at with . Black might get the double hane plus the hane at c in sente. Then white has "gained" some 20 points where she had already likely territory, whereas Black gained strength in the center and increased the size of his corner. unkx80: Black 45. For about five days nobody made a move, I'll just make one to keep the game going. Charles Matthews White 44. A chance to fight back. I think Black 41 should just extend. dnerra: Aha, now that you say this I have to agree. HolIgor: . There is an option of sagari here too. It is difficult to choose. Feel free to criticize. unkx80: Pro players will tell me that direct capture is better than the descent, because the descent invites the block in sente. May I nevertheless venture to say that perhaps should have been where now is? Now the Black stones in this corner get in harmony with the ones in the center... IMVVHO White should have kept them separated with the classical Tsukenobi joseki. Charles I agree. Come on, White Wolves. The Black Sheep seem to be out-gunning us. Dave: . I'll play the obvious and leave it to someone else to think later. Charles Matthews White 34: I'll play again, to keep the game interesting. DJ White 30: A rengo is a rengo is a rengo. DaveSigaty: Black 27. After the exchange of 25 for 26, 27 aims at making it difficult for White to get enough out of the right side to balance Black's upper and lower corner. If White becomes strong in the upper right, I think that White 26 will begin to look like kikasare. exswoo:Is Black taking this corner a better move than the lower left? Or are they about equal? I was looking at the board for some time and each corner seems to have its own advantages. The lower left corner seems to work in conjuction with the other black stones well but allowing White to take the upper right seems to give White a very strong position. Dave: I think that Black has good potential in the bottom left if he plays first there. On the other hand, Black also has interesting potential there if White plays first :-) By interesting, I mean that Black can look forward to using his center stones effectively to limit what White can achieve. If we look at the right side from a similar point of view, I think it is interesting for Black to try to prevent White from getting full value from her center stones. Since the center was mapped out early in this game, a lot depends on whether or not the investment in the center pays off. Black has started off taking territory in the corners. If White can not compensate for this with equal terrirtory on the sides and in the center, she will fall behind. 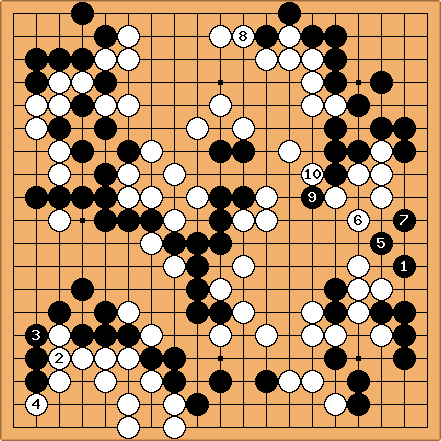 White is going to have a tough time on the left and along the top due to the orientation of Black's center stones and the remaining aji in the Black stone in the upper left. Meanwhile Black 25 is also a solid base from which to fight for an equal or better share of the bottom. At present, I think that Black's overall position is very interesting. I think that Black 25 was an excellent idea - probably White 24 needed to be the high move at d to prevent this. exswoo Sorry, I didn't know that anyone felt that way about me playing moves on both sides. I just figured that this would keep the game moving at a brisk pace since the rengo games seem to take months to play out. I'll stick with Black from now on then, since I was responsible for the mess up on the upper left. 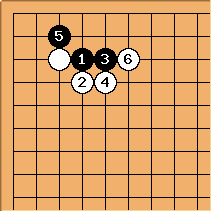 Migeru: White 24: I hope it's OK for another double-digit kyu to join at this point. I am thinking it's time for tenuki. 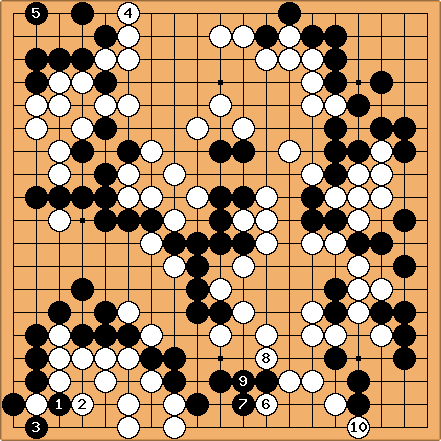 I was considering playing on one of the free 4-4 points, but I don't want to allow Black to play a shimari. exswoo Just to keep the game moving...I give you Black 21 and White 22. I think Black 23 is decided as well...I wonder if my overplay at Black 15 could turn out to be any useful? DaveSigaty: Shouldn't Black cut at a once White chooses White 20? exswoo: I didn't consider that move when I played 21 but...wouldn't the end result strengthen White even more? Of course, I know you have better judgement on these matters than I do, but I'm not too convinced about this one. I'm guessing something like this would result...and White will play somewhere afterwards to either protect the cut( somewhere around c?) or make a base...right? Charles White 20 (rather than a hanging connection) deviates from any known pattern or joseki, but clearly central influence in this game invalidates joseki anyway. 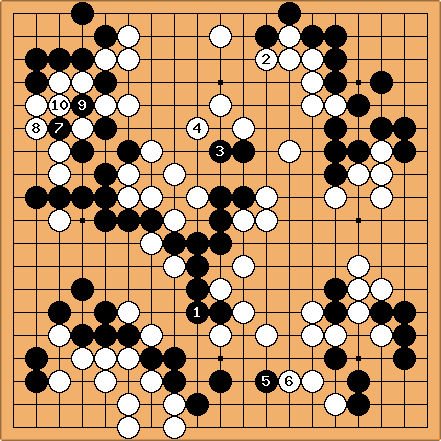 It leaves a position in which Black's corner is alive. On the other hand it does more against the cutting stone. I think Dave's suggestion of the immediate cut is one good way to play. White might end up connecting solidly with White 8 now at b here so as to leave no forcing moves at all. Orthodox is the keima connection at d, but my feeling is that White might soon regret leaving the cut at b, for tactical reasons. dnerra: My assumption was always that the keima connection is only good if White has two ladders to choose from after Black cuts. Here in this situation, there would remain kikashis around e, as well as squeeze possiblities by cutting at b followed up with f.
unkx80: If I am not wrong the joseki goes like this. Charles White 20. Light play - perhaps. dnerra: Yes, the problem is that we have to live in our corner first, so that we can't make use of the cutting stone. Also, life in the corner will be smaller and in gote. 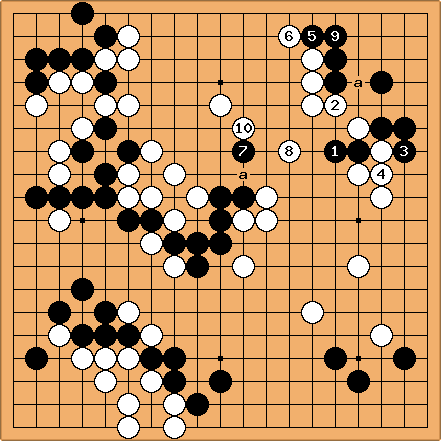 exswoo: Black 15:The obvious answer? HolIgor: White 14. I have never played this. Let's try it. Lucky White 12: I have to agree, Black 11 is not very inspired, much too greedy. Black will gain at most 10 points in the corner - White will make a wall. The black stones in the middle are starting start to look a little like a weak group instead of thickness. Normally it is bad to invade under hoshi too soon, this game is no exception. Anyway, it is not yet finished. DJ Dear stronger friends, I have a question: I was considering which side to block from for White 12, and after some thinking and much more personal feeling, I decided that blocking from the other direction (what is now Black 13) could have been the right guess (for instance because White's influence would develop down the left side, contrasting with Black's...). Now I see that Lucky himself chose the other direction: may I ask to be enlightened on the reasons for this? Lucky In this specific position, I can't say which direction is definitely better. The usual wisdom says to block on the bigger side. It seems to me that the left side is more important than the upper side. The central groups split more or less their influence toward the upper side: neither can make many points there. The left side was Black's zone; if White can make a solid position on the left side then she's happy. DJ I see. Thanks a lot! dnerra I also found it hard to decide on which side to block; I too, DJ, would have chosen the other side. My reasons was exactly that Black was stronger on the left side. The stones on the third line that White would get at b after the usual joseki seemed sufficient to nullify Black's influence, while White's wall can still do something at the top. Let's say it the other way round. After the joseki Lucky intended to choose, the left side is more important (just looking at the corner stones) than the top side. That is exactly where Black is already standing. Lucky, what do you think? unkx80: To me both sides seem the same too. 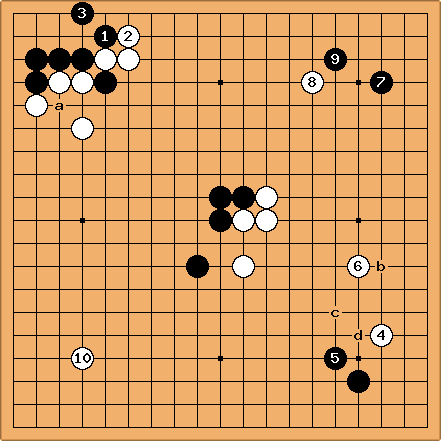 DaveSigaty: To me it is an interesting question whether White should tenuki here and play on the right. Then the situation becomes that Black built the center thickness and followed up with a low play at 3-3. In response, White has played at 4-4, a (perhaps) natural move to cut the relationship between Black's center and corner. Black's upper left corner will end up being larger than when White plays first but overall is White better or worse? HolIgor: Shitsurei shimashu. (I am going to be rude). I think that this point has to be discussed. 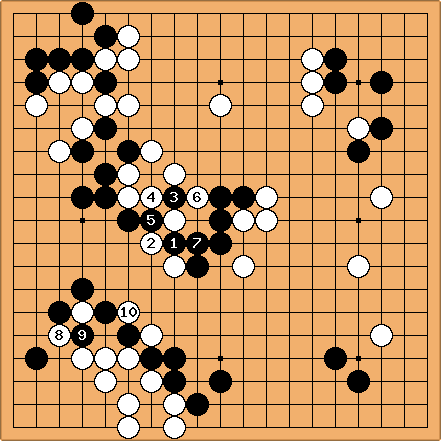 Black has found the tightest point on the board to make territory. This cannot be the correct approach. The usual kakari in such cases sacrifices a stone for the benefit of the exit to the centre. Such greed is characteristic of kyu-level players. 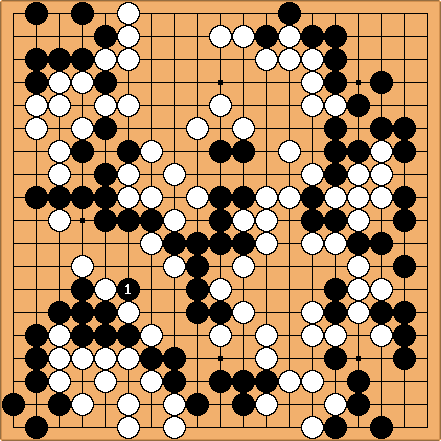 When for a period I played san-san regularly, I was amazed that in many cases my opponents insisted on getting territory under it. The next diagram shows how to achieve this. I am IGS 1k only and my word has no authority to it. Would stronger players comment on the move in the game, please? Arno, 1 dan: I have to agree with HolIgor. Black 11 is a bad move. Black has built up some influence in the center, so he should use it wisely. Exswoo is right that if White builds a wall (naturally after the 3-3 invasion) it will cancel out with Black's influence. But the point is that Black is also losing his influence which is much worse than White losing hers. The only points worth playing are either approach moves to the corner (kakari) - I'd prefer the two-point kakari on the fourth line - or ignore the part for the time being and occupy the lower left corner. The lower left corner is a very good point for Black: if White approaches, Black plays a high pincer and uses his center influence naturally. If she doesn't approach, then Black approaches the upper white corner, again putting his center influence to optimal use. Black 11 destroys the "spirit" of the game so far. exswoo: Ah, I see what you're saying. I didn't think of the move as in terms of Black losing influence as well, just that the end result for White won't be very good. 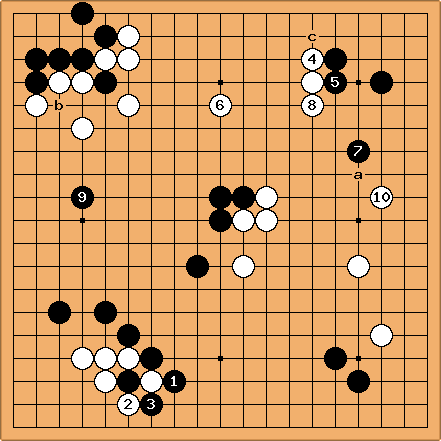 Should White play out the local sequence here or tenuki for now? unkx80: I agree with Arno and HolIgor. Firstly, the timing is wrong as there are still open corners and other big points like the sides. Secondly, the point to approach the upper left corner is wrong, it should not be san-san. I believe a better way for Black to approach the upper left corner is a. Lucky: . Isn't it a nice point? Skelley , the only move! dnerra: : Who said this is an aggressive game? Lucky: I didn't have the nerve to cross-cut. dnerra: I was tempted by BSR2003B5Alternative here. exswoo:White is going to play very aggressively. Charles I have problems with as played - White can only lose.